As a tech-nerd, I bring my electronics with me no matter where I go. My iPhone, laptop, Nintendo Switch, and GoPro get used every day and when you’re out in the middle of the woods with no electricity, it becomes a challenge to keep them alive. I remember before I bought a power bank how I would spend time in front of outlets at Starbucks, restaurants, even some retail stores. I always had the charger with me in case I would run into an outlet. But let me tell you, I am glad that’s a thing of the past. When I bought my 10,000mAh power bank, it was very expensive compared to what’s available today. Today you can buy a power bank that will charge your phone for a whole week for the price I paid just a few years ago. Since USB has evolved, and USB-C can charge laptops and even gaming consoles like the Nintendo Switch, one big battery could be all you need for all your devices. Today I would like to share the best power bank chargers on the market for travel and camping. I decided to pick products from several price points to give you an option no matter what kind of budget you have. If you don’t know what mAh means and how to calculate how many times you can charge your device, scroll down to the Frequently Asked Questions where I will go through this. One more thing, while there are power banks with built-in solar panels, they’re way too small to be efficient and convenient. Leaving batteries directly in sunlight is also not recommended. If you want to charge your power bank with solar, I recommend buying a solar panel that you connect to the battery bank. 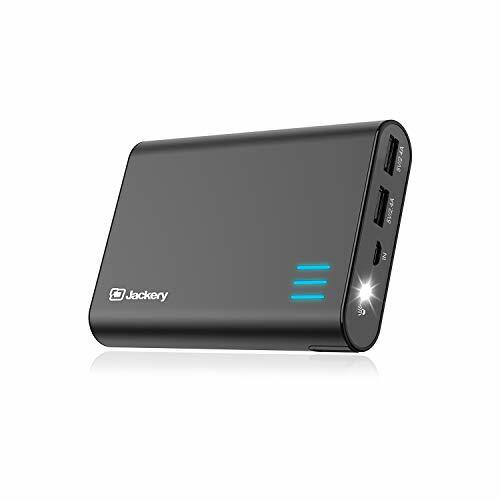 The first power bank we’ll look at today is from a company called Jackery. Jackery makes all kinds of portable chargers in different sizes. Although the name might imply otherwise, the Giant+ is one of their smaller ones with 12,000mAh capacity. That is enough to charge the iPhone XS at least 2.5 times. What’s nice about the Giant+ compared to the other products we’re looking at today is that it’s small and lightweight. Easy to throw in a backpack when you’re going on a hike, or use on an airplane. Built into the portable charger is a LED flashlight that could be very useful if you’re camping and need a light at night. You’ll get two USB-A ports, rated at 5V/2.4A which will let you charge your phone relatively fast. The 5W charger that comes with iPhones, for example, are rated 5V/1A, so you’ll be able to charge your iPhone faster than with the standard wall charger. The Giant+ charges through the Micro USB port that you’ll find right next to the USB-A ports. There are also three LED bars that will tell you how much battery is left. One bar is 33%, two 66%, and three means fully charged. Although it’s missing a USB-C port, it can charge the Nintendo Switch. The included power adapter with the Switch is a 5V/3A so it won’t be as fast. Therefore I recommend turning the Switch off while you’re charging. You should also make sure you get a high-quality USB-A to USB-C cable. I use the Anker Powerline USB-C to USB 3.0 Cable to charge my Nintendo Switch. In the box you’ll get a Micro USB 2.0 cable that will charge the power bank. The AUKEY PB-Y14 is a flat battery pack with 20,000mAh capacity. That’s enough to charge an iPhone 8 over 7 times. Thanks to the design it’s one of the few battery packs that you could fit in your pants if your pockets are big enough. AUKEY has put tons of inputs and outputs on this thing. You’ll get 3 USB-A outputs, one USB-C input/output, Lightning input, and a Micro-USB input. There’s no information on the USB-A’s V/A, but the USB-C is capable of 5V/3A, making it a great charger for your phone, iPad, GoPro, and Nintendo Switch. The USB-C port is not a PD (Power Delivery) port and has a max wattage of 15W output, so it won’t charge most laptops very fast. 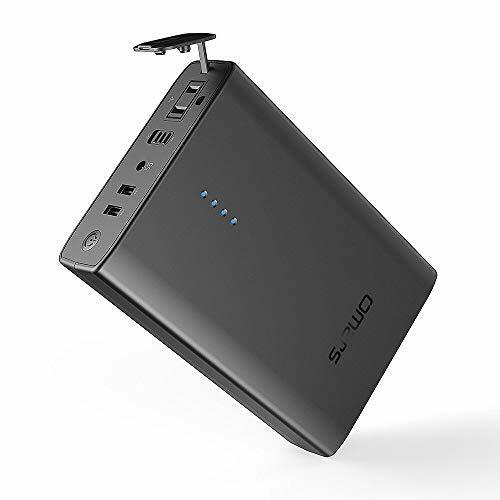 15 watts is definitely enough to fast charge your smaller devices though and with this much capacity, it would be a great companion on a camping trip or airplane ride. TSA allows battery packs up to 100Wh (Watt Hours) and the AUKEY is 74Wh. In the box you’ll get a USB-A to USB-C cable that you can use both to charge the power bank with but also charge other devices. Note that this is the only power bank in today’s comparison with a built-in lightning port. What this means is that you can use your regular iPhone charging cable to charge the power bank. Four LED lights on top will let you know how much battery is left. Next up is the RP-PB058 from a company called RAVPower. Every time I look at product categories where RAVPower has a product, I’m left impressed. They offer similar products to what other companies like them do, but often at better prices. A friend of mine bought a RAVPower Power Bank last year and haven’t had any issues with it at all, so it doesn’t seem like they’re using low-quality components either. Anyway, this is a power bank with 26,800mAh of capacity. Right under the allowed capacity that you can bring on an airplane. To learn more about these restrictions, check out the frequently asked question section at the bottom of the post. With 26,800mAh you can recharge an iPhone XS up to six times, a Galaxy S9 Plus almost five times, and an iPad Mini 4 three times. You’ll get one USB-C PD port that can deliver up to 30W of power. Two USB-A ports rated at 5V/2.4A, and one Micro USB input for charging the battery. Due to the fact that the USB-C port is a Power Delivery port, you can charge most new Macbooks with this. But also a Nintendo Switch while playing and a laptop like the Dell XPS 12. That USB-C port will also be nice to have when charging. With a 30W wall charger, you’ll be able to charge up the battery in about 5 hours, compared to using a Micro USB cable that would take about 14 hours. In the box you’ll find a USB-C to USB-C cable, 2 Micro USB cables, and a travel pouch. So will it be able to charge your laptop? Well, take a look at the charger that came with your laptop and if it’s rated for more than 30 Watts, the RAVPower charger won’t be able to charge it very fast or at all. Next to the power button, there are 4 battery indicators so you can keep track of how much battery power you have left. In the intro I was talking about how fast power banks have evolved and so much new technology is being released every year. Don’t believe me? Well, take a look at this power bank with a built-in AC output. AC, as in the same kind of electric outlet you’ll find in a house. This unit is made by a company called Omars. Not only does it have an AC outlet, but the battery has 40,200mAh capacity, 146Wh. Unfortunately, that is too big for TSA and if you try to bring this onto an airplane, you’ll most likely lose it. But if you travel by ground, this thing is a beast. The AC outlet is rated for up to 90 Watts, meaning most laptops will be able to be charged with it. There are two USB-A ports rated for 5V/2.1A which will let you charge devices like phones, GoPros and headphones relatively fast. An included DC adapter will charge the power bank when it has run out of juice. Note that you can’t use the AC port while the power bank is charging. So is this the power bank for you? Well, if you need an AC output and don’t travel by air it very well could be perfect. How long it will last for you depends on what devices you’re planning on charging and for how long. If you’re doing heavy work on a laptop it won’t last more than an hour or two, but if you buy it with realistic expectations to bring it with you on travels, I think you’ll love it. The PowerCore+ is made by Anker which is a very popular phone accessory brand online. It’s an airplane friendly power bank with 26,800mAh capacity. That’s enough to charge an iPhone X over six times and a Galaxy S9 almost six times. It’s the second product we’re looking at today with a USB-C PD output that will let you charge devices via USB-C at up to 30 Watts. That’s enough to keep your Nintendo Switch charged up while playing as long as you’re not connected via HDMI as that requires more power. Next to the USB-C output, there are two USB-A ports rated at 5V/3A each. Those ports will quickly charge phones, tablets and GoPro batteries. In the box you will get a 30W USB-C wall charger, a Micro USB cable, a USB-C to USB-C cable, and a travel pouch. I like that they include a USB-C wall charger. It will fully charge the power bank in less than five hours. Since the PowerCore+ is very similar to the earlier mentioned RAVPower I thought we could compare them a little bit closer. They have the same battery capacity and USB-C PD capabilities, while the PowerCore+ has slightly higher rated USB-A ports, it weighs almost half a pound more. 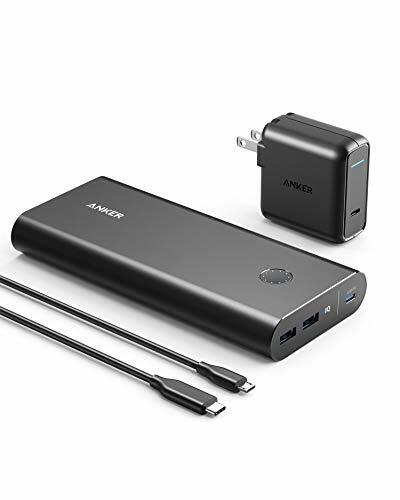 Anker includes a USB-C wall charger which was my only complaint about the RAVPower model. One last thing I like about the Anker model is that the battery indicators have 10 dots instead of 4, which will make it easier to follow how charged the battery is. In the end, both of them are fantastic products, and I think they’re so close in terms of features that I would go with the one that is the cheapest at the moment. It might be smart to include the price for a USB-C wall charger if you’re going to wanna charge the power bank fast. Last up is the Krisdonia NJF-5X. If you’re looking for the power bank with the highest battery capacity in today’s comparison, you’ve found it. 50,000mAh won’t be allowed on airplanes, but if you’re traveling by ground this power bank will keep your devices charged for possibly a week depending on use. 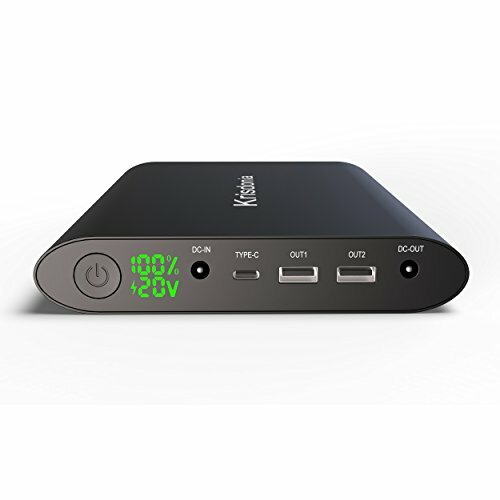 When it comes to inputs and outputs, you’ll get two USB-A ports 5V 9V 12V/3A capable of quick charging phones and tablets, one USB-C port powerful enough to power a Nintendo Switch unless it’s connected through HDMI. And last but not least, a DC output which is for charging laptops and notebooks. Krisdonia includes 28 types of laptop charge connectors to make sure that you’ll be able to charge your specific brand of laptop. It even comes with a MagSafe 2 cable so owners of older MacBooks can charge up. When charging your notebook with the Krisdonia power bank you’ll set the voltage depending on what your notebook charger says. It’s capable of 5V, 8.4V, 9V, 12V, 16V (16.5V, and 20V (19V, 19.5V). In other words, if you’re not very tech-savvy it might not be your best choice. A DC input charges the power bank from 0 to 100% in about 8 hours. What I really like on the Krisdonia power bank is the battery percentage shown next to the ports. There’s nothing better than a percentage so you know exactly how much juice is left in the power bank. It also tells you the voltage it’s set to. So what’s included in the box? A bag for the battery bank, a DC charger, a Magsafe 2 cable, a DC cable output, a USB-A cable, and 28 different laptop charge connectors. Any power bank is better than no power bank. To have extra battery power can be a lifesaver in some situations and everybody with a phone should have a power bank. Since it’s something that everybody should have it’s also a great gift. I have given power banks to family members that have later told me how nice it’s to have, even if you’re just at home. Being able to charge up a phone while sitting on the couch instead of having to leave it by an outlet is convenient. Good: Jackery Giant+ 12,000mAh – The Jackery Giant+ is not as big as the name would imply, but with 12,000mAh it will charge most phones at least twice before needing a charge. It’s a good size if you’re looking for a battery bank to put in your backpack when going on a hike. Better: Krisdonia NJF-5X 50,000mAh – If you need tons of power, the Krisdonia is a great choice. Being able to charge your notebook with a power bank sounds like a feature from the future, and with quick charging USB-A ports and a USB-C port powerful enough to run a gaming console like the Nintendo Switch, it’s an impressive piece of technology. 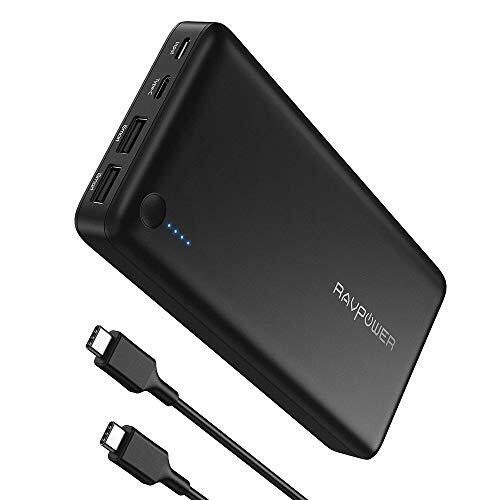 Best: RAVPower RP-PB058 26,800mAh – It might be at almost half the capacity of the Krisdonia, but if you need a power bank mostly for your phone, tablet and Nintendo Switch with the occasional laptop charge, the RAVPower is an incredible power bank that is small enough to bring on an airplane. It recharges in five hours with a USB-C wall charger and will charge several devices at once. What’s the difference between USB-C and USB-C PD (Power Delivery)? Goal Zero has a great post explaining the differences between USB-C and USB-C PD that you can find here. Power banks must not exceed 100Wh. If you know the mAh and volts you can do a quick calculation to find out the Wh. If you don’t know the voltage, most power banks made with lithium batteries are 3.7V. So let’s take the RAVPower Power bank for example, its capacity is 26,800mAh and is made with lithium cells which usually are 3.7 Volts. Since the WattHours is under 100, it’s OK to bring on an airplane. How do I calculate how many times my device can be charged? First you want to know how big the battery is in your device, in mAh. Then we can quickly check how many times you’ll be able to charge your device. If a power bank has 10,000mAh capacity, and your phone has a 5,000mAh battery, you should be able to charge your phone twice, right? Since 10000/5000=2. Well, in a perfect world it would be that easy. Unfortunately, when the power bank transfers power to your phone there is always loss due to resistance. They can’t transfer 100% of the power. How efficient the power bank is depends on what kind of battery cells it uses and the quality of the components used. I recommend calculating with about 80% efficiency, as that is more accurate in the real world. So we’ll do 10000/5000=2, then 2*0.8=1.6. This means that a power bank with 10,000mAh capacity can charge a phone with a 5,000mAh battery 1.6 times. 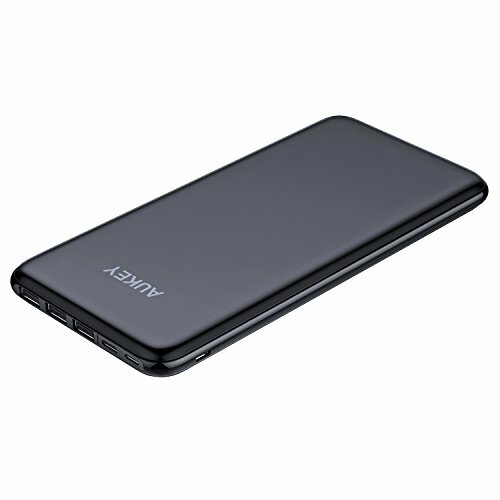 Does X Power Bank support X device? To know if your device can be charged by a specific power bank, you’ll have to know how much power the device requires, and how many amps and volts the power bank can output. If you’re having issues finding this information, please leave a comment and I will do my best to help you. What are some high-quality USB-C cables? Power banks are safe if they’re made with safe components and has safety features. Therefore I recommend only buying power banks from reputable brands that advertise these safety features and/or certifications. These features include but are not limited to smart charging, overcharge protection, over-voltage protection, and protection against excessive current. A power bank could become unsafe if used wrong. Using it in high temperatures or around water is not recommended. If you have any questions related to batteries and power banks, please contact me or leave a comment down below.